This Scarecrows in Motion display was created for the 2001 Kurrajong Scarecrow Festival. 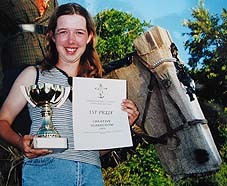 The display consisted of a life-sized scarecrow man mounted on a scarecrow horse that was jumping over a gate. Both scarecrows were handmade. The scarecrows represent the story of Banjo Paterson's famous Australian poem, The Man From Snowy River. It took one week to create this display. With the display are scarecrow makers (left to right): Les Dollin, Carol Webster, Julia Webster and Anne Dollin. The Man from Strawy River is a true-blue Australian stockman, with his bush hat, boots and stockwhip. He is mounted on a jumping horse that was described as a 'feat of engineering' by the Kurrajong Scarecrow Festival judges. 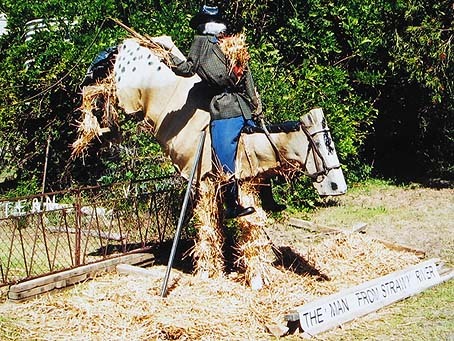 The Man from Strawy River display was shown to the Kurrajong Scarecrow Festival judges and passers by at our property on Saturday 20th October 2001. 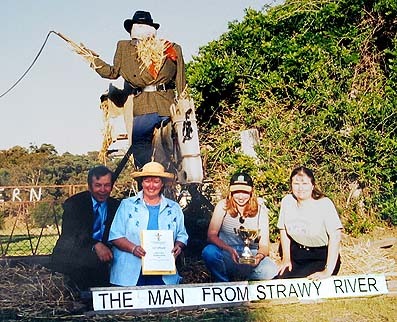 The Man from Strawy River display was awarded the Margaret Garcia Trophy for the Overall Winner of the Kurrajong Scarecrow Festival in 2001. © 2008. scarecrows-in-motion.com.au . All Rights Reserved. A page about the Scarecrows in Motion displays created for the Kurrajong Scarecrow Festival.